"The most disappointing finding is the number of children meeting the daily recommendations for fruit and vegetables"
So I thought it might be illuminating to discuss what the Heart and Stroke's Health Check program considers fruit and why juice sweetened options like "Dole Squish'ems!" are not fruit equivalents. 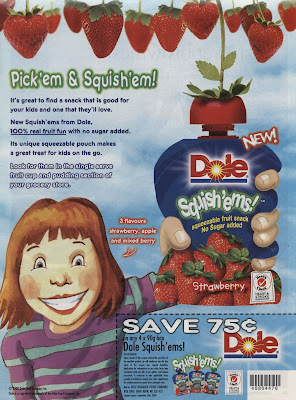 Dole Strawberry Squish'ems! come in 90 gram packages. Each package contains 50 calories, 11 grams (nearly 3 teaspoons) of sugar and 1 gram of fibre in a red fruit based goo that you're meant to squish into your mouth. Strawberries on the other hand come in self contained berries. An equivalent 90 grams of them contain 29 calories, 4.2 grams of sugar (1 teaspoon) and 1.8 grams of fibre. The 2 added teaspoons of sugar and nearly double the calories in the 90 grams of Squish'ems! vs. actual strawberries comes from added sugar, though not the white stuff, instead it's the sugar that comes from adding juice concentrates and fruit purees. Of course it's still just sugar and certainly the addition of fruit juice concentrates will have the same metabolic effects as would the addition of table sugar or high fructose corn syrup (a vegetable based concentrate). I guess the Heart and Stroke Health Check technical advisors skipped that day of school. Great job Heart and Stroke Foundation - I'm sure adding sugar to fruit and berries can only help improve childhood obesity rates. Wondering how many strawberries your kid could have for those same 50 calories? 50 calories worth of strawberries would be just over a cup of berries and would still give your kid 1 fewer teaspoon of sugar and triple the fibre of the "no-sugar added", sweetened with juice concentrate, certainly not actual berries, Frankenfood you and/or your unsuspecting children squish into their mouths with the blessing from the Heart and Stroke Foundations' dietitians that it's good for you. So clearly berries are far healthier. That said, also important in obesity prevention is satiety. What do you think would be more filling? A bit more than a cup of berries or just over a third of a cup of goo?